New from GPO: FDLP eXchange Webcast Series. A new series of tutorials that offer users task-based instruction in navigating FDLP eXchange (Needs & Offers Listing). H.R. 5305 IH – FDLP Modernization Act of 2018. Dated March 15, 2018. Summary of key provisions, ALA Washington Office, Dated March 16, 2018. Draft of Title 44 Reform bill, Dated December 11, 2017. The U.S. Federal Depository Library Program disseminates information products from all three branches of the Government to over 1,250 libraries nationwide, including more than 250 libraries in the Southeast. In this effort, the Regional Depository Libraries within ASERL are exploring ways to enhance cooperative training, outreach, service and collection analysis and development activities to improve access to Federal government information for the citizens in the region. This collaborative effort would further the Government Printing Office’s (GPO) objective of increasing cooperation among Regional Depositories. Any programs developed by ASERL in this regard will ensure that Regionals continue to fulfill their legal responsibilities to Selective Depositories as described in Title 44 of the U.S. Code. For a more detailed description of the program, please view the Overview of the Collaborative Federal Depository Program and the Leadership grant from the Institute of Museum and Library Services (IMLS). The Guidelines are the product of a process that first began in 2006, involving many years discussion among ASERL library deans/directors, documents librarians, and review by GPO counsel. To view previous versions of the Guidelines, please visit the Archives page. 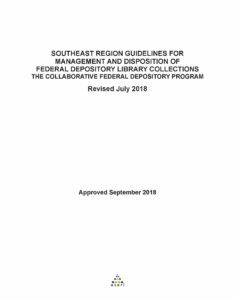 Oversight and Governance: The ASERL Federal Depository Library Program (FDLP) Steering Committee is comprised of library deans and directors from Regional and Selective Depository Libraries in the Southeast Region. The Committee provides long-term oversight and governance for this initiative, as well as to lead the effort to identify Centers of Excellence necessary to establish, at minimum, one comprehensive FDLP collection in the region. The FDLP Steering Committee works closely with the ASERL Collaborative Federal Depository Program (CFDP) Steering Committee. First established under the IMLS Leadership Grant, the CFDP Steering Committee continues to provide guidance and support for the program, reviews processes and reports, participates in program promotion and evaluates, and assists in resolution of issues. Inventory holdings and ensuring accurate cataloging and holdings records for the extant collection at each site. Support other COEs by providing catalog records to the ASERL COE database for gap analysis efforts. Fill identified gaps in COE collections. Develop expertise to facilitate use of the COE collections. Facilitate access to FDLP and COE titles through Inter-Library Loan. Digitization efforts are also encouraged. Facilitate cooperative training initiatives to share expertise within the depository community and participate in public awareness and outreach campaigns to promote federal government publications to libraries within the region. List of Agencies Yet to be Chosen – Sorted by SuDoc stem (pdf). Please note: This is not a comprehensive listing. Additional agencies/SuDoc stems can be added should a library elect to serve as a COE for an agency or subject area not currently represented. 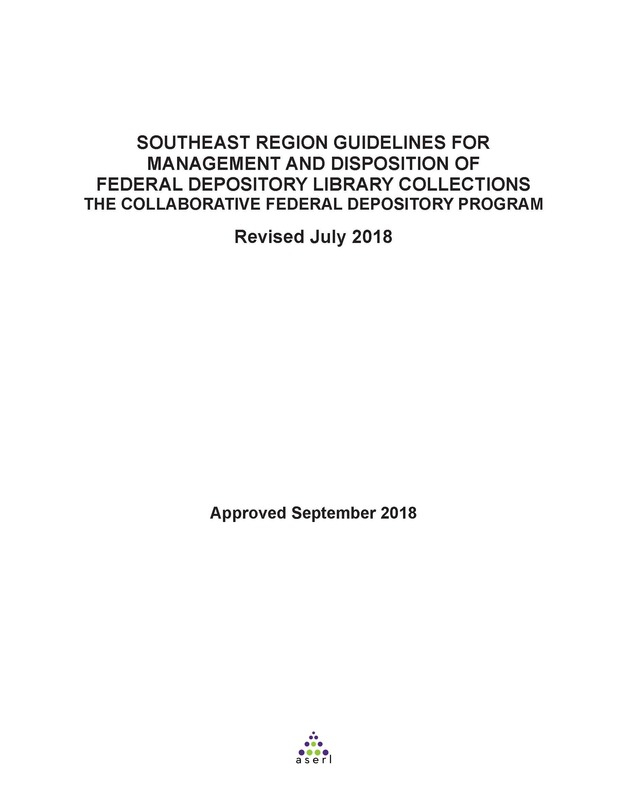 The University of Florida has developed software to facilitate the disposition of federal documents within the Southeast as a means of supporting the ASERL Guidelines for Managing FDLP Collections in the Southeast Region. See the UF LibGuide that describes how the software works and a videorecording of the January 30, 2014 database demo for more information. Login to the Disposition Database at http://apps.uflib.ufl.edu/GovDocs/ using a Google ID. Either a Gmail account or a non-Gmail account may be used (to sign up for a non-Gmail account go to https://accounts.google.com/NewAccount). To activate your GoogleID with the Disposition Database, send a request to dispositiondb@uflib.ufl.edu. Disposition database email notifications which your library receives will be sent from DistributionNotifications@uflib.ufl.edu. The Disposition database uses contact information from the Federal Depository Library Directory (please keep info current). The ASERL COE database is the primary gap analysis tool for the CFDP program. The database is comprised of brief cataloging records that indicate holdings for COE libraries (and other contributing depository libraries) in the Southeast and serves as a tool for analyzing the completeness of COE collection(s) and to identify gaps. MarcEdit download – a free Windows-based software program used for editing and manipulating MARC data, developed by Terry Reese (Oregon State University). Linking Task Lists in MarcEdit – creating and using the task automation tool in MarcEdit. ASERL Regionals Listserv – to subscribe, unsubscribe, or change the preferences on your subscription. ASERL Selectives Listserv – to subscribe, unsubscribe, or change the preferences on your subscription. Charleston Conference, November 4, 2011 “ASERL Collaborative Federal Depository Program: Innovating within a Regulatory Framework” – presentation is available for viewing on the 2011 Charleston Conference ShareSlide Group. ASERL’s CFDP Receives Award for Innovation in Federal Documents Additional information on the ProQuest/GODORT/ALA “Documents to the People” award can be found on the ALA website. Program Contacts: For questions about this effort, please contact Cheryle Cole-Bennett, Coordinator, Collaborative Federal Depository Program or John Burger, ASERL’s Executive Director.